With the latest Ben Roethlisberger allegations still going on and the 2010 NFL draft lingering right around the corner, I have been reading and hearing several comments from Steeler Nation suggesting the Steelers should draft Tim Tebow because of his altar boy like image. 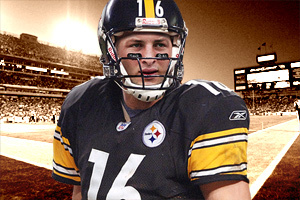 Yes, I am clearly aware that Ben\’s actions as of late have not been very Steeler like. I also am aware that Ben has not been charged with any crime. He has been judged already in the public opinion and regardless of the outcomes in Georgia and Nevada, Ben will always wear that scarlet letter right next to the Steelers logo. Just because Tebow has a squeky clean image and happens to play quarterback is not reason enough for the Steelers to draft him. Especially not before round 5 as most fans are wanting. Even if by some slim chance Roethlisberger were to be suspended for a few games in 2010, Dennis Dixon would be your starter and has earned the chance to lead the team. Also it would not be surprised to see veteran Charlie Batch brought back or even Byron Leftwich should he be released by Tampa. The Steelers do not need a quarterback of the future right now. Merely suggesting the Steelers draft Tebow because of his Steeler like, good character image, is stupid. After round 4 and assuming the Steelers have addressed several, more important needs in the draft, I could see Tebow as a possible selection, but still a remote one at that. Tebow was a great college quarterback, but so was Danny Wuerffel, another Florida quarterback. Wuerffel was drafted in the fourth round of the 1997 NFL Draft by the New Orleans Saints, but never materialized into a NFL QB and was out of the NFL in 2002. I know Tebow is saying all of the right things, but his path is trending the same of that of Wuerffel. The Steelers will likely draft a quarterback late in the draft or sign one of the undrafted free agents following the draft as a camp arm, but trying to place Tebow on the Steelers because of his character is a foolish reason.